Hey, you look nice today. There’s one free compliment. Now go get a bunch more at Emergency Compliment! Humor: Perceptions of Real Estate Infographic! Have you ever heard of the real estate acronym FSBAW? What do real estate listings really say? Here are 10 honest (and funny!) definitions. Yikes! Here’s an open house you don’t want to miss…. or do you? Is this the FSBO understanding of full disclosure? A little joke on youth and hubris for real estate brokers. This is a good joke that’s been floating around for a number of years. We couldn’t determine the original source, but hopefully you’ll find it entertaining all the same. 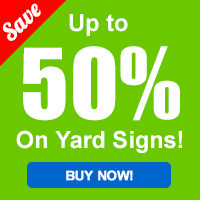 This yard sign rider is too funny… and so true! How many times has a “PRICE REDUCED” rider drawn out the kooks?